Emergency personnel and bystanders rushed to help the injured after a van plowed into pedestrians near a busy Toronto intersection, according to eyewitnesses who saw the chaotic, bloody scene unfold on Monday afternoon. "I saw the van exactly on the sidewalk," said Kasra Ebrahimi , a student who was a few blocks south of Yonge Street and Finch Avenue, near Byng Avenue, at the time of the attack. "It hits people, it looks like movies. I saw people go flying … people were screaming and yelling," he said. Four or five people were left on the ground, said Ebrahimi, who watched as police and ambulances arrived and tended to the victims. "But I don't think they were still alive." The van travelled south, where Dainis Cevers said it cut him off near Parkview Avenue. He saw it strike another man, thought to be homeless, as he was crossing the street. 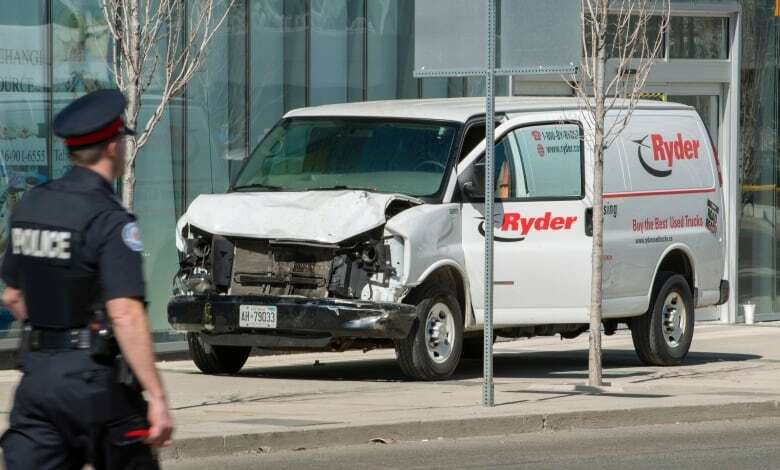 "The [van] comes from the second [lane], accelerating fast, going towards this homeless guy," Cevers told CBC News. The victim "flew up, flew up in the sky," when he was struck. Cevers said he stopped and tried to help. "I tried to see if the guy was OK, but he was bleeding from the head — unconscious, eyes open." 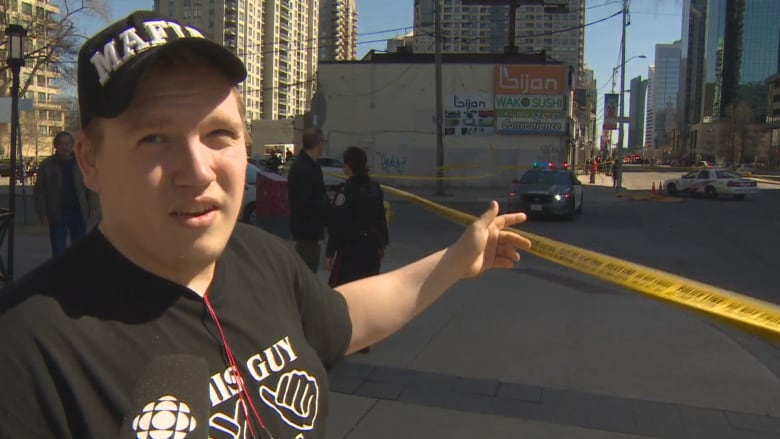 Others came to help and called 911, he said, as the van continued south at high speed, crashing into vehicles on the west side of Yonge Street. "There's nothing I can say. I feel terrible," Cevers said. The van narrowly missed Vasiola Bibolli as she was leaving a nearby Starbucks. She hadn't seen the van coming, but a friend snatched her out of the way. "She was like, 'Oh my gosh, watch out!'" Bibolli told CBC's As It Happens. Moments later, the van struck another two pedestrians, including an old woman. "Then people really started to panic," she said. "The sidewalk is always packed around lunchtime, so it was full. And people are screaming and yelling." Closer to Sheppard Avenue, student Amir Bahmeyeh said he was coming from the subway when he saw "the crazy van" hitting people "one after one." He didn't get a good look at the driver but said "he drove really fast, like crazy," and hit five people at about the same time near Mel Lastman Square. "I almost have a heart attack," he said Bahmeyeh, who is originally from Iran. "When I came here people told me it was a safe country … the people are friendly. That is why I stay here. Now, I saw the accident, maybe I'll go back to my country. There are not problems like that." Nana Agyeman-Badu, a driver who was dropping someone off in the area, saw some of the carnage along the busy Toronto street. Agyeman-Badu told CBC News he saw the van driving on the walkway. "I was thinking, why is he driving there?" He said he thought perhaps the driver was making a delivery, but then the van kept moving. Agyeman-Badu drove away and parked next to a bus shelter. A woman was coming north, he said, and saw the van approaching. "She tried to stand aside, but she was not lucky ... she got pinned into the bus shelter," Agyeman-Badu said. "She was pushed backwards, lying down, with all the glass ... broken glass on top of her." The van, he said, just kept "going and going and going." He said he rushed out of the car to try to help, along with another driver who had stopped. The woman asked where she was, and they had to tell her she'd been knocked down by a van.